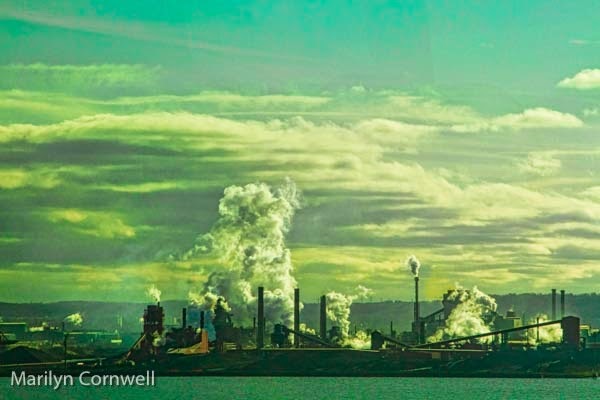 I took this picture of the Stelco view from the Burlington Skyway from the bus while commuting a few winters ago. It is a different story this weekend. A dump truck with its truck bed raised hit the bridge last week on the Toronto-bound side. There were workers on the scaffolding so it could have been a tragic event. The truck was massive and the impact significant so the bridge will be closed all weekend. It is currently being assessed for structural damage. This is pretty big news for us here in the Niagara region. It is a holiday weekend here in Ontario. There aren't that many easy alternatives to getting around that corner of Lake Ontario. It is one of the major routes to the US border crossings at Queenston, Niagara Falls and Buffalo. 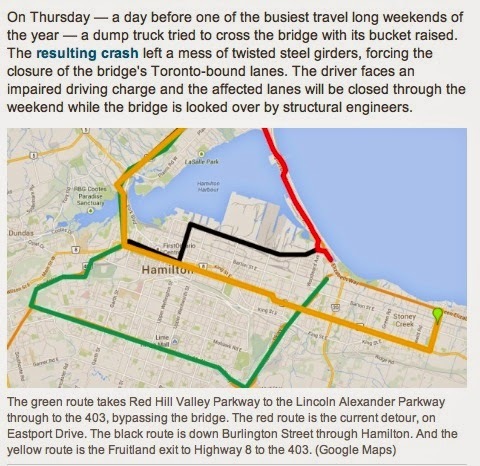 Here's the CBC coverage of the traffic routes around the Lake for those of you in distant places. Grimsby is the next stop after Stoney Creek.